This post contains affiliate links. If you make a purchase through an affiliate link, I get a small percentage of the sale. 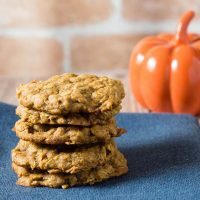 These chewy pumpkin oatmeal cookies are flavored with spices and nutty browned butter, and are loaded with caramel chips. It’s my favorite time of year — Pumpkin Week! 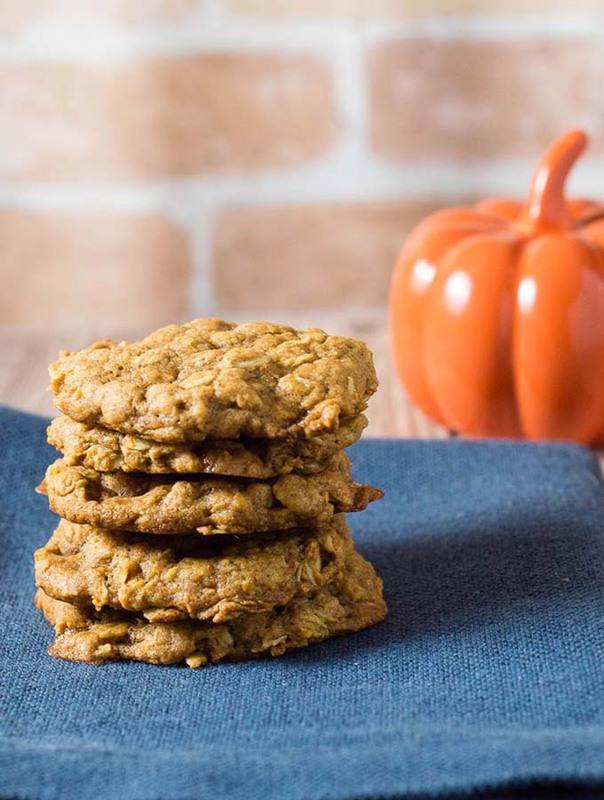 I teamed up with a group of food bloggers to share all kinds of pumpkin recipes, including drinks, savory recipes, sweet recipes — even dog treats! 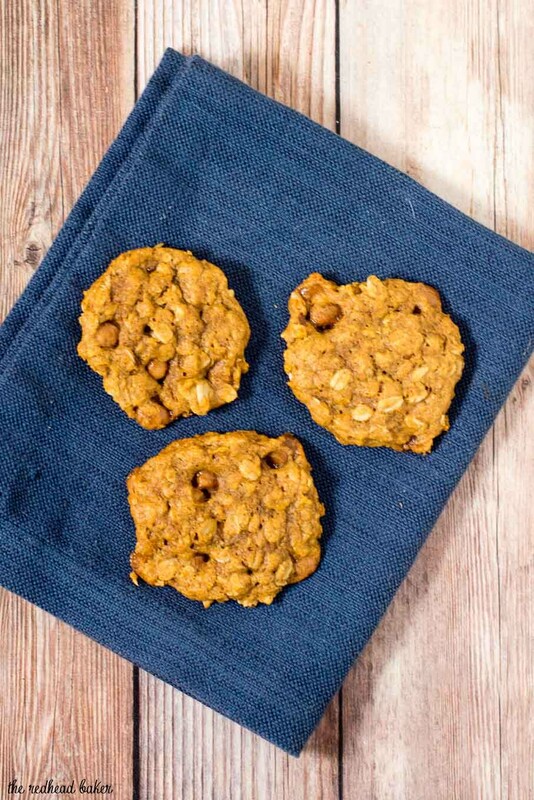 Today’s recipe is one of my favorite cookies, oatmeal, with a pumpkin twist. There are several more steps to this recipe than most other cookies, but the result is so very worth the extra effort. The first extra step is removing excess water from the pumpkin puree. If you don’t, your cookies will spread way too much. It’s pretty easy to do: line a bowl with two layers of paper towel. Measure the pumpkin into the bowl. Fold the paper towel over the top and press into the pumpkin puree. Leave sit while you go on to brown the butter. Browning the butter is another step not usually found in cookie recipes. In involves melting the butter in a saucepan and continuing to cook it until the milk solids in the butter begin to turn brown. When this happens, they start to emit a nutty aroma that pairs well with the pumpkin. I added caramel baking bits to my cookie dough, but cinnamon chips or chocolate chips (regular or white chocolate) would also be delicious. Or skip the mix-ins, and drizzle a simple icing (powdered sugar and milk) over your cookies. 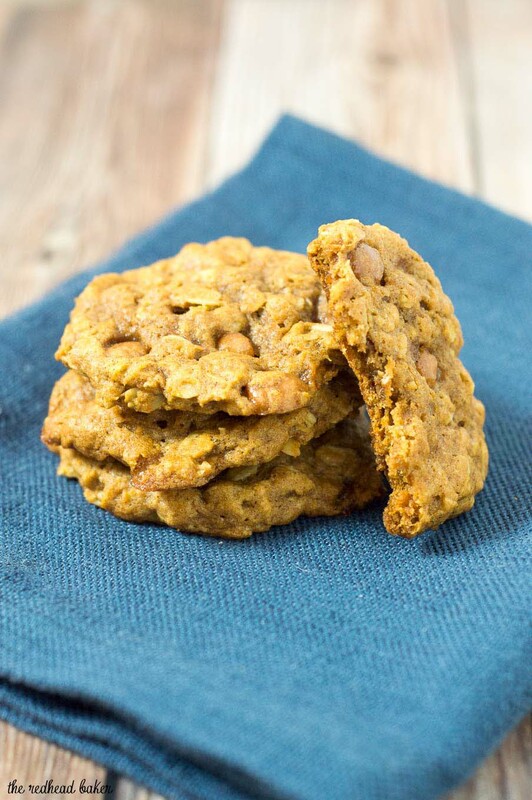 When storing these cookies, I recommend placing a square of parchment or wax paper between them to prevent sticking. That is, if there are any left to store — better make a double batch because these cookies will be gobbled up quickly! Slice the butter up into pieces and place in a light-colored saucepan. (Light colored helps you determine when the butter begins browning.) Melt the butter over medium heat, stirring occasionally. Once melted, the butter will begin to foam. Keep stirring occasionally. After 5-8 minutes, the butter will begin browning-- you'll notice lightly browned specks begin to form at the bottom of the pan and it will have a nutty aroma. See photo above for a visual. Once browned, remove from heat immediately and allow to cool for 5 minutes. 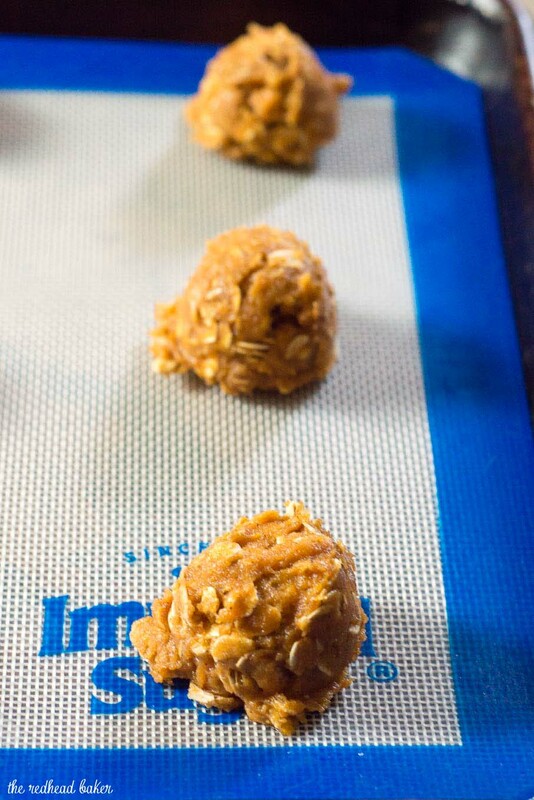 Preheat oven to 350 degrees F. Line two large baking sheets with parchment paper or silicone baking mats. (Always recommended for cookies.) Set aside. Pour the slightly cooled brown butter into a large bowl. Whisk in the granulated sugar and brown sugar until combined. Whisk in the egg yolk and vanilla extract until combined, then whisk in the blotted pumpkin (see note about blotting). Slowly mix the dry ingredients into the wet ingredients until combined, then mix in the caramel bits. The cookie dough will be thick and sticky. Using a medium cookie scoop, scoop cookie dough into balls (about 2 heaping Tbsp of dough each) and place 3 inches apart on the cookie sheet. Slightly flatten the balls out-- see picture above-- as the cookies won't spread much unless you help out first! My go to cookie recipe uses melted (and then cooled) butter so often times I brown the butter while I’m at it cause why not? 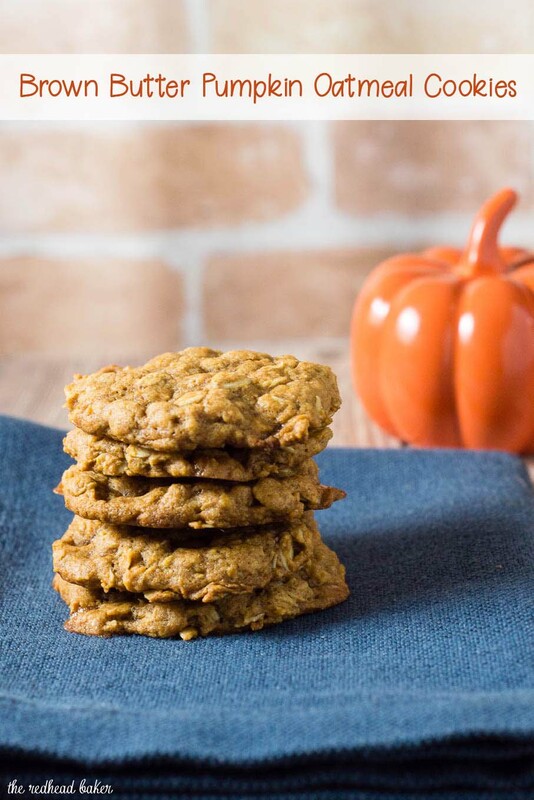 For these cookies I bet it adds just that little bit of extra to pair so well with the oatmeal and pumpkin! These sound delicious. Love the addition of caramel bits. These sound amazing. Caramel and brown butter? yum!! Oh yes! Love everything about this! I love baking with caramel baking bits! 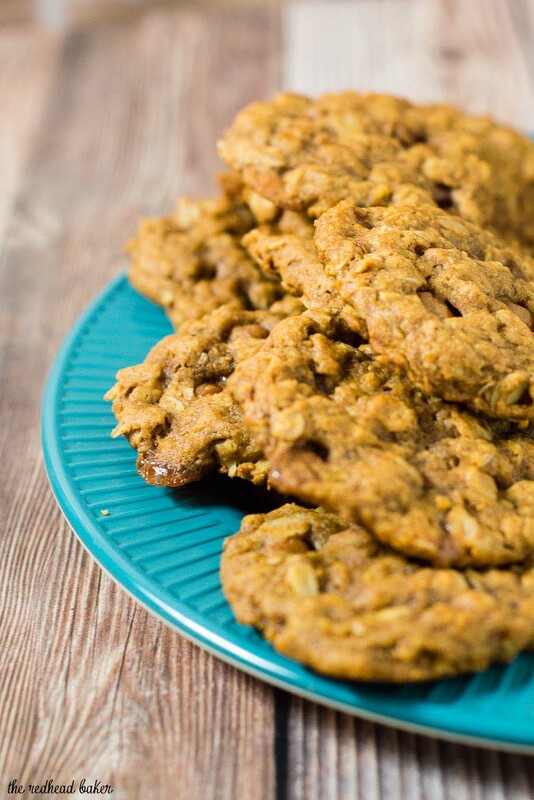 These cookies looks so good, and I love the spices, too!